Some quick tests by pinging to the DNS server at 192.168.20.1 and a few other machines on the network showed that both the VPN connection and Internet access now worked fine after the setting change. That was it, just a simple setting change, or so I thought. Unfortunately it was not that simple. Another issue came when I realized I could not access 11.1.11.10, another computer on the network, which I used to be able to before the setting change. Pinging the computer simply received no reply. Turning on “Use default gateway on remote network” and the server became accessible again. 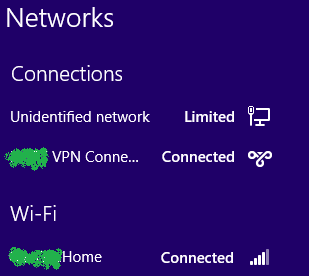 By default, a newly created VPN connection on Windows will have “Use default gateway on remote network” enabled, which sends all network traffic on your computer through the VPN connection. 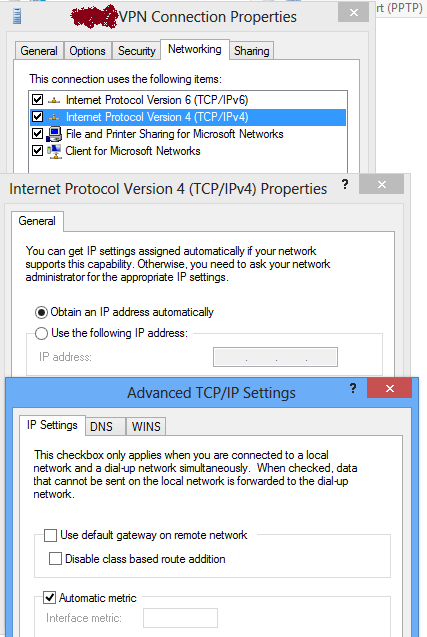 If there are multiple established VPN connections with the option “Use default gateway on remote network” checked, Windows will automatically pick the network with highest priority. The priority is usually defined automatically, but can be changed by unchecking “Automatic metric” and specifying a manual metric value. For each established VPN connection, a default route will be added for network based on a single class-based network ID, unless “Disable class based route addition” is checked, in which case no default routes will be added. How does this explain the behavior I encountered? The answer lies in the automatic addition of default route. When the computer routes all traffic to the VPN connection (e.g. “Use default gateway on remote network” is checked), all requests will be routed through the VPN default gateway and thus I was able to access 192.168.20.1 and 11.1.11.10, despite not being able to access the Internet (since the VPN network is isolated). However, when the VPN does not have traffic priority (e.g. 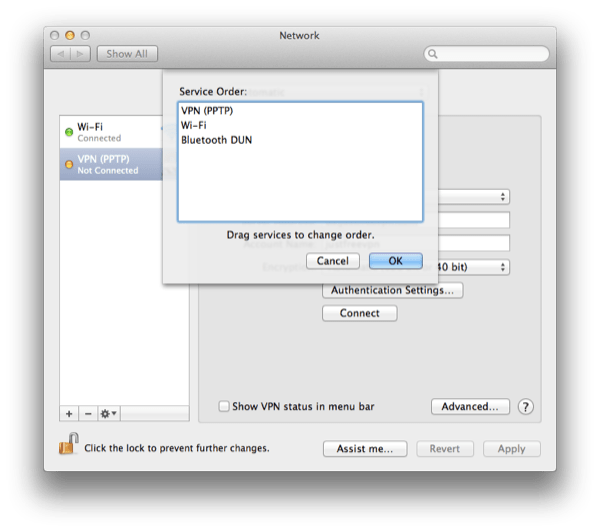 “Use default gateway on remote network” is unchecked), requests will be routed through the wireless connection, unless there is a specific route from the target IP address to the VPN default gateway. In my case, the DNS server IP address (192.168.20.1) is within the single class network covered by the default route and is therefore automatically accessible. However, IP 11.1.11.10 is on a different network class and not covered by the default route, causing its requests to terminate on the wireless connection default gateway and failed. With this, you can ping the 192.168.x.x network, 11.1.11.10 and any other 11.x.x.x IP addresses with no issues, while at the same time still able to access the Internet. Interestingly, during my research, I found many forum posts claiming this to be a bug with Windows networking stack. Microsoft also published a hotfix here, although this is intended for cases where Internet access is still limited despite the VPN providing full Internet access, and not for my cases where the VPN indeed has no route to the Internet. Most answers I found (even on MSDN) simply suggested unchecking “Use default gateway on remote network”, which result in replies saying that the internal network is inaccessible following the changes, defeating the purposes of the VPN! Of course this will be the case unless the behavior of default route addition is understood. Also, although the route command supports a -p parameter to add a persistent route which will still remain after a reboot, I have found its usage to be buggy. Firstly, the presumably persistent route will still be removed after reboot and needs to be re-added. Secondly, when the route is re-added, there will be an error message “The route addition failed: The object already exists” even though the route effectively does not exist. 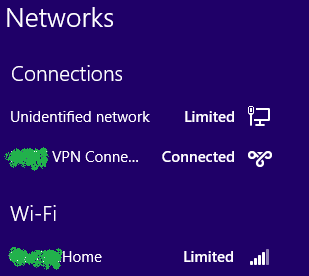 This may indeed be a Windows networking stack bug, or might perhaps be a problem with my network settings. This command will need to be prefixed with sudo or otherwise run as superuser (via su for example) to be executed successfully.